If this thread looks familiar, it's probably because another BF member bought an almost identical frame a few days before I did and started a thread about it. I posted a couple of pictures there, but I figure rather than hijack that thread completely I'd start my own to share my progress and solicit feedback. I also shared a bit of this in the catch-of-the-day thread, so I guess I'm spamming a bit. Sorry. I'm not entirely certain as to year and model. My best guess is that it's a 1979 A-D "Team". There is no trace of a model name on the top-tube and most of the other decals are intact, so I think it never had a model name decals. The first thing I did was to remove all the beast-of-burden stuff and put on new wheels and tires. And, of course, I took a few minutes to admire the details. 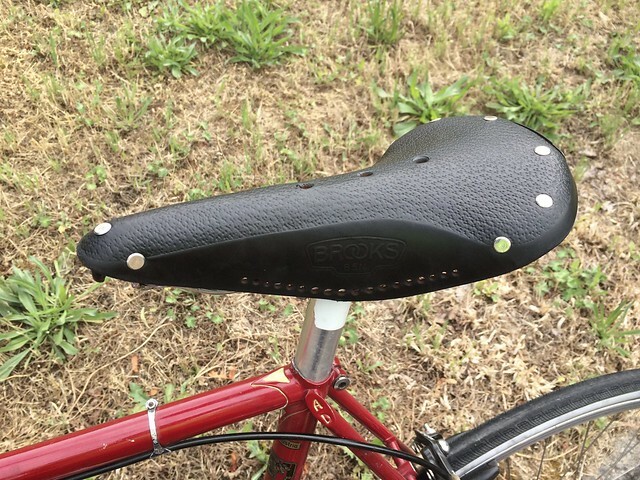 The date code on that Brooks BN5 says it was made in 1979. I'd love to know what was done to preserve it. 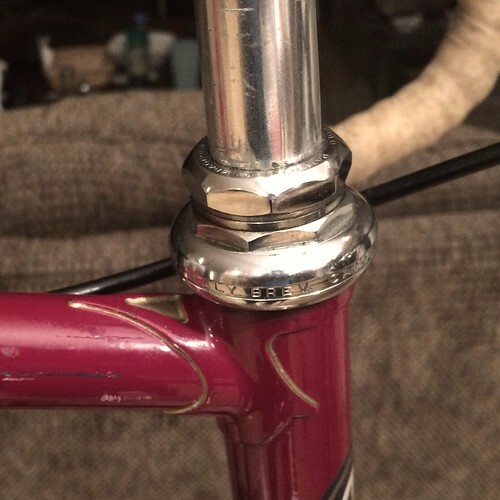 The Campy dropouts and headset (the latter of which is immaculate, in spite of the impression left by the picture above) point to using Italian components, but that's not the direction I want to go with this. Right now, what I'm thinking is a stealth modern build with 10-speed downtube shifters and shiny silver early 2000's Shimano components. 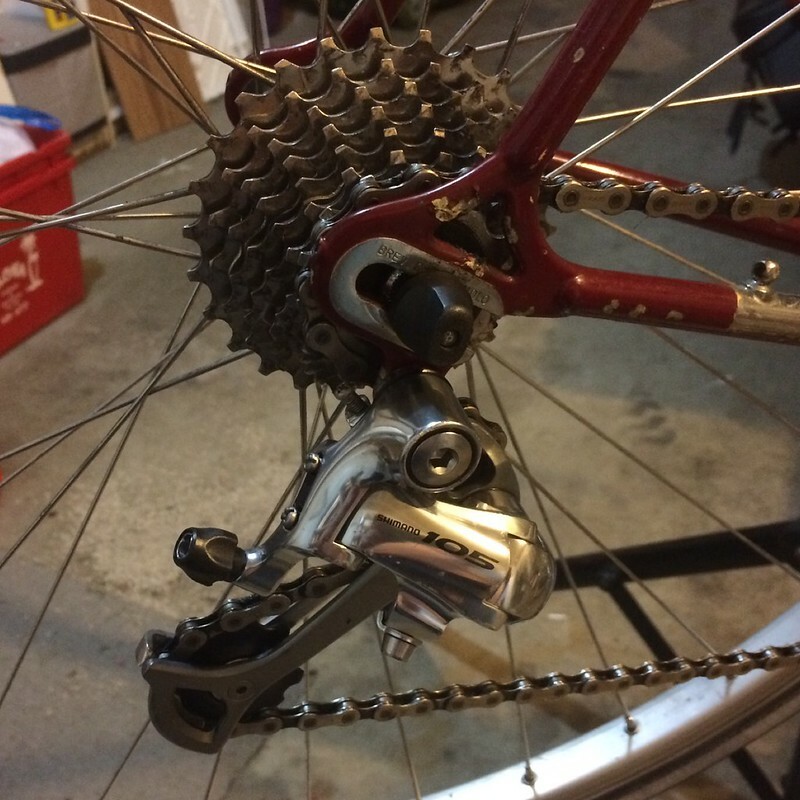 I also got an Ultegra 6503 front derailleur, but I need a braze-on adapter to get it installed. The bike came with 1051 brake levers, and I'm planning to leave those. 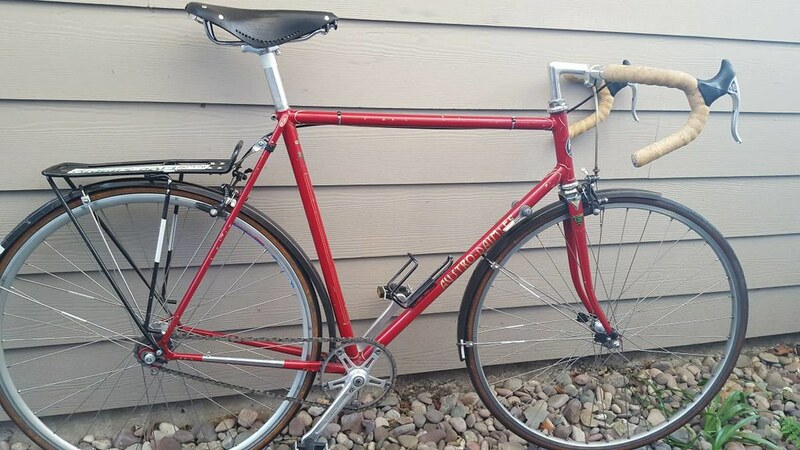 I think I'm going to build it 3x8 and use the Shimano Sport LX shifters that came with the bike for a while, but I'll probably replace them with SL-7900's before the end of summer. The crankset is my biggest dilemma. The bike came with a Sugino Super Mighty crankset which looks great but I don't have the legs to ride around with a 52-42 double all the time, and I've already got one of those on another bike that I've designated for flat rides. So I want a triple. Modern Shimano triple cranksets are obviously fairly ugly. I'm trying to convince myself that a 105 5603 wouldn't be awful, but I think an Ultegra 6503 would be aesthetically closer to what I'm after. A polished silver vintage triple is the look I really want, but I haven't seen one in the price range I'd like to spend. 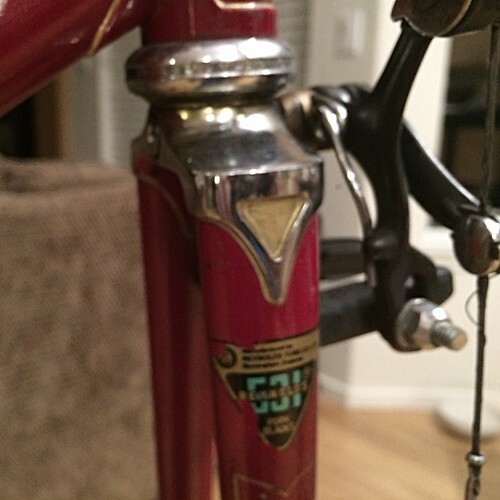 I've considered committing the heresy of putting a Campy crank on with Shimano components. I've already got the Campy headset, so it's not like I haven't already had to stifle my inner purist. I've also considered getting a triplizer for the Super Mighty. Check Ribble cycles and look at the stronglight triple. Maybe you will like that. Would match the look of your existing components pretty well. That Stronglight could work, but I'd like to keep the cost under $50 unless I can find something really nice. The Stronglight is OK, I think, but it isn't exciting. 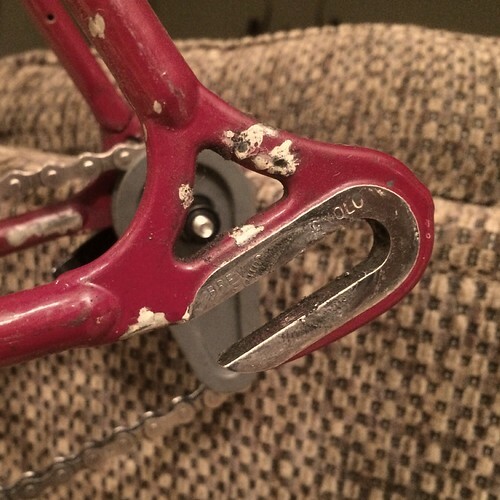 I've got an old FSA Gossamer crank that has silver crank arms, but I've scuffed them up pretty badly over the years. 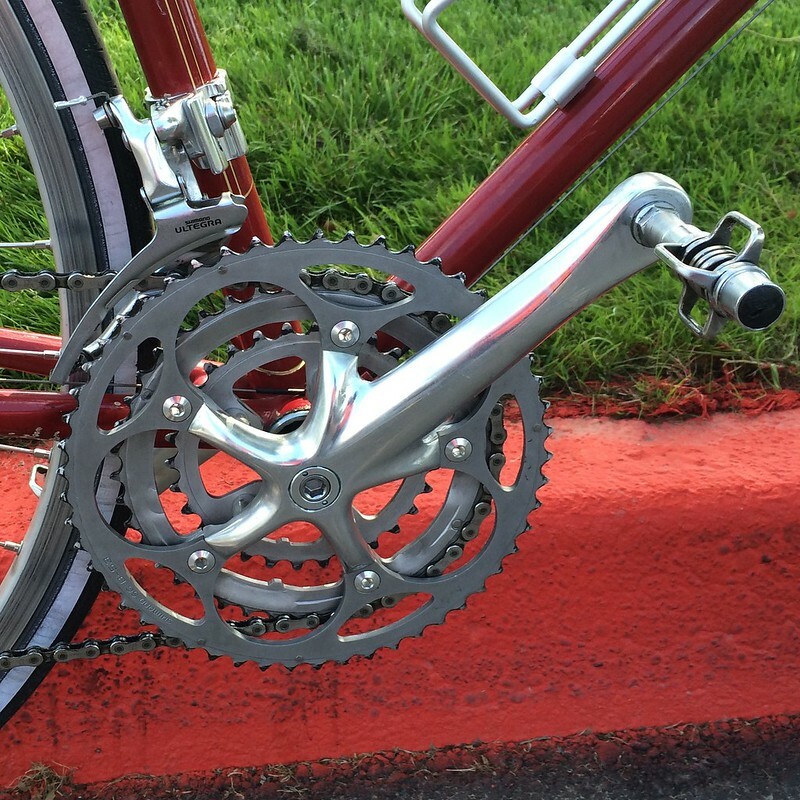 I put silver chainrings on there and it should be a tolerable placeholder while I shop around for something better. 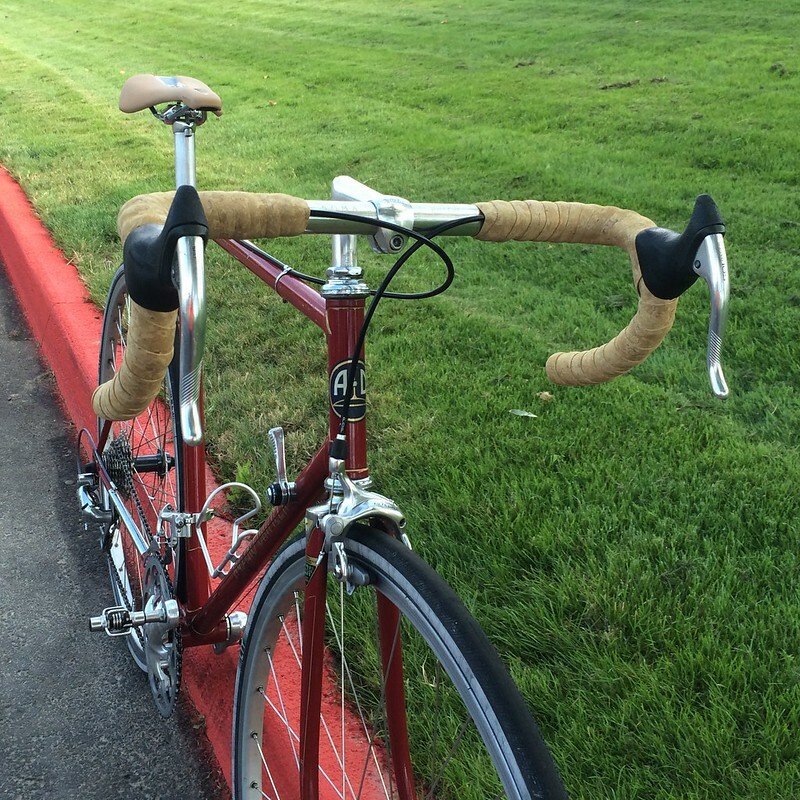 Yeah, that Ultegra triple is good match for your 105 RD, both kinda clean and slick looking. That 5603 105 is pretty fug, if you ask me. That 5603 105 is pretty fug, if you ask me. I think you're right. I've been trying to convince myself otherwise, but I don't think it's working. Looks like this one should turn out very nice, +1 for a Stronglight, also. 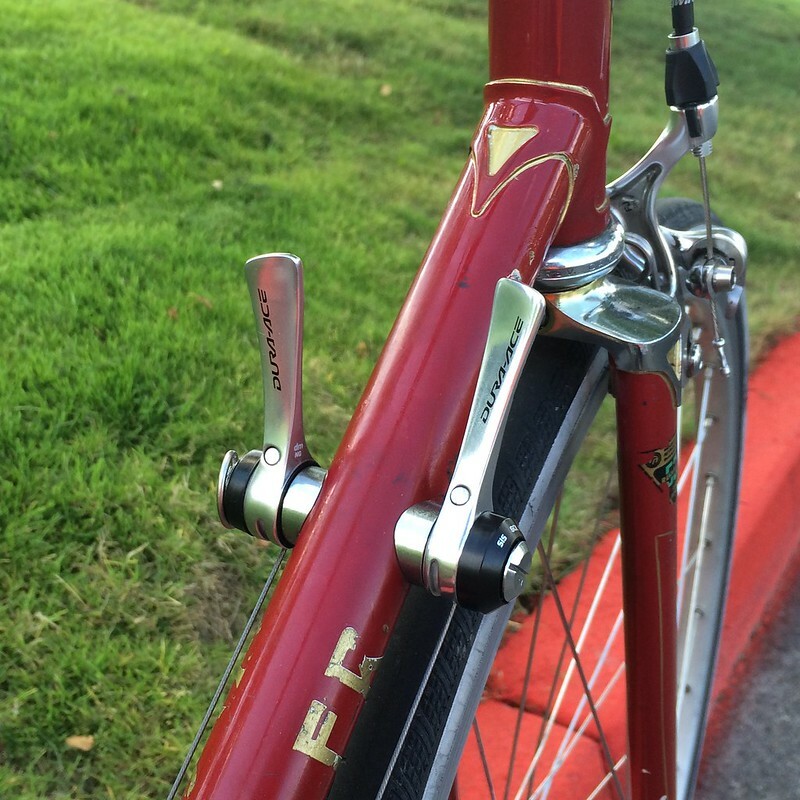 I agree about the 105, in this case, old Dura Ace, or even early Ultegra,if you aren't going the Campagnolo route. Best of luck with your build, following this one. I dunno if people outside of engineering use this euphemism much, but "I'm not there yet" on the 10/11 speed cranks either. How much up/down market from 105 are you willing to go on this build? Should be plenty of RX100 and Deore LX triples out there for cheap but in good condition, with a pretty neutral silver color (the 1057 tint risks clashing with other grays). 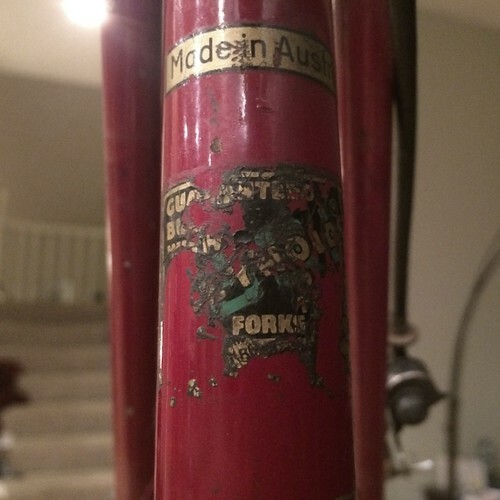 Heck, it looks like Boulder Bike even has some of the former in NOS condition: Shimano RX 100 Crankset triple 30/42/52 170mm Never used! +1 for the triplizer, long live the Mighty Super Mighty! I now have it in a ready-to-ride state with gears. In fact, I rode it to work this morning. It's still nowhere near the "final" state (if such a thing even exists), so I intend this as just kind of a teaser pic. 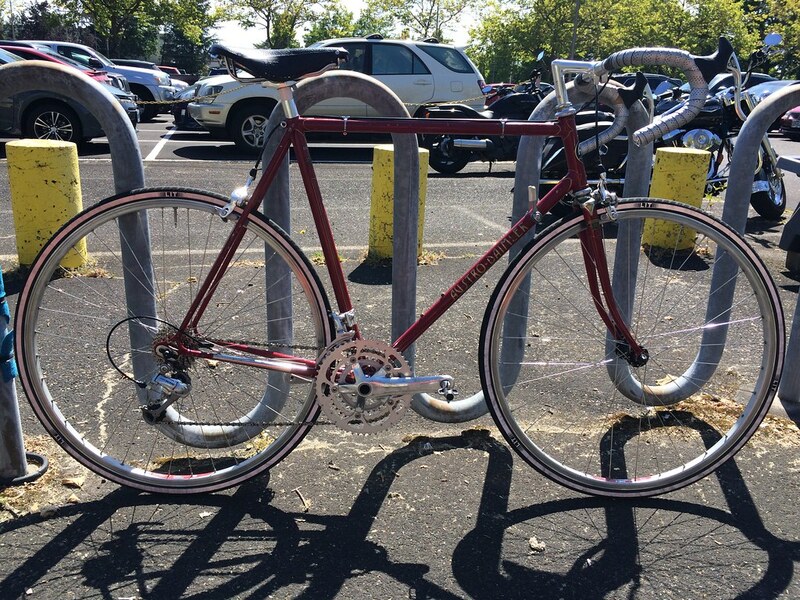 It may also serve as a suitable entry for a "how not to photograph of a bike -- where's Waldo edition" thread. This is using the FSA Gossamer crankset I mentioned above. It looks OK from about 15 feet away, but I just got a 6503 crankset on eBay that I hope will be better. 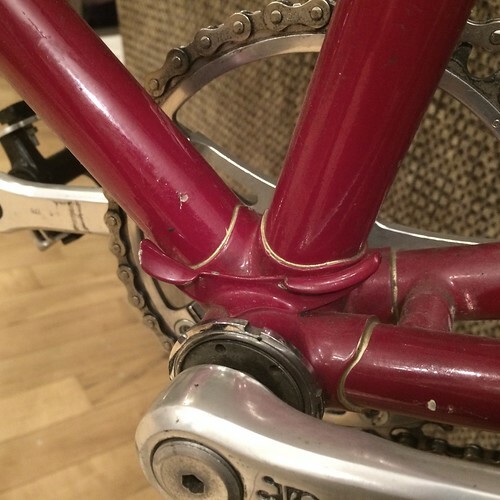 The original cork bar tape didn't survive the necessary removal for changing the brake cables. I didn't have any other cork tape on hand and I think I'm going to need a shorter stem, so I went with some previously used bar tape that I keep around precisely for temporary/can't-wait-to-ride-this builds like this. 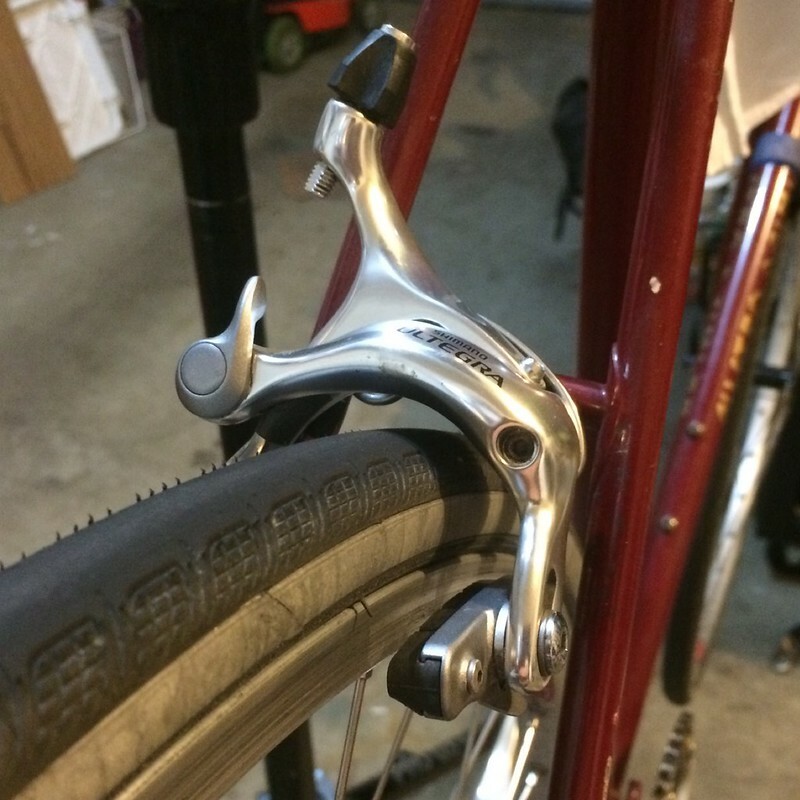 The 6600 Ultegra brakes are way better than the Modolo's were, but I'me sure at least some of that has to do with how gummed up the old cables were. I was pleasantly surprised by how well the Sport LX shifters worked. I may not be in any rush to upgrade this to 10-speed. I don't like the "ratcheting" feature on the front shift lever. Is there any way to get rid of that and have it just feel smooth? It took me a while to get back to this, but I've been gathering parts. I put it together last night and rode it in to work today. I'm probably going to change out the stem to get the fit dialed in a bit more and I'm eventually going to build some new wheels for it, but it's mostly done now. All these A-D threads have got me wanting one! Yes, Austrian bikes are great. 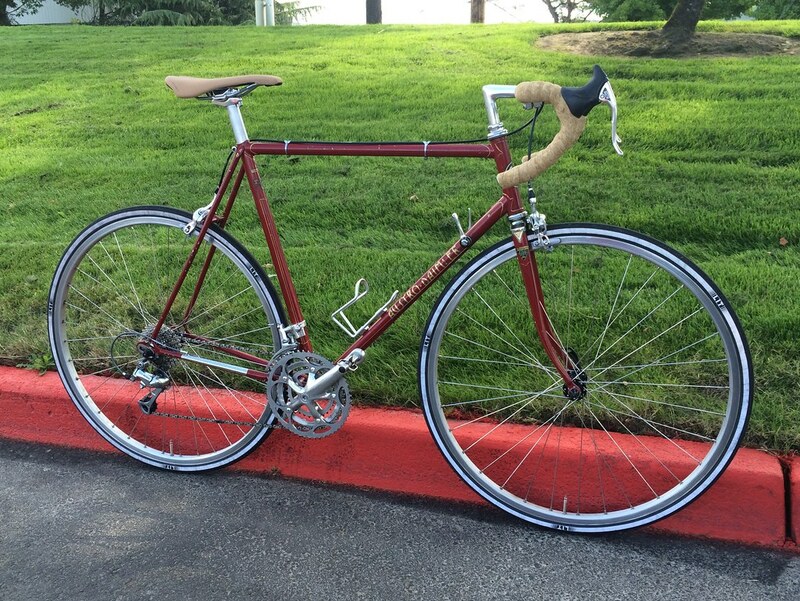 I really like this resurrection of a fine old geared road bike. For some bikes I think singlespeed conversion can be a fine way to extend the bike's useful lifespan. This wasn't one of those bikes. 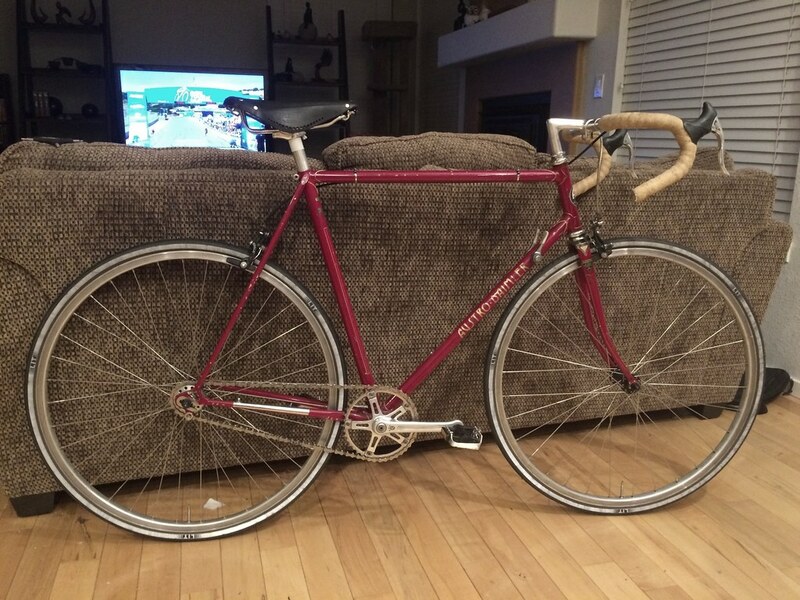 I'm planning to use the singlespeed wheelset I got with this bike to prolong a rusty old Nishiki Olympic. I don't feel bad about that at all. The guy I bought the Nishiki from told me it would have been heading to the recycler if he hadn't found a buyer soon. 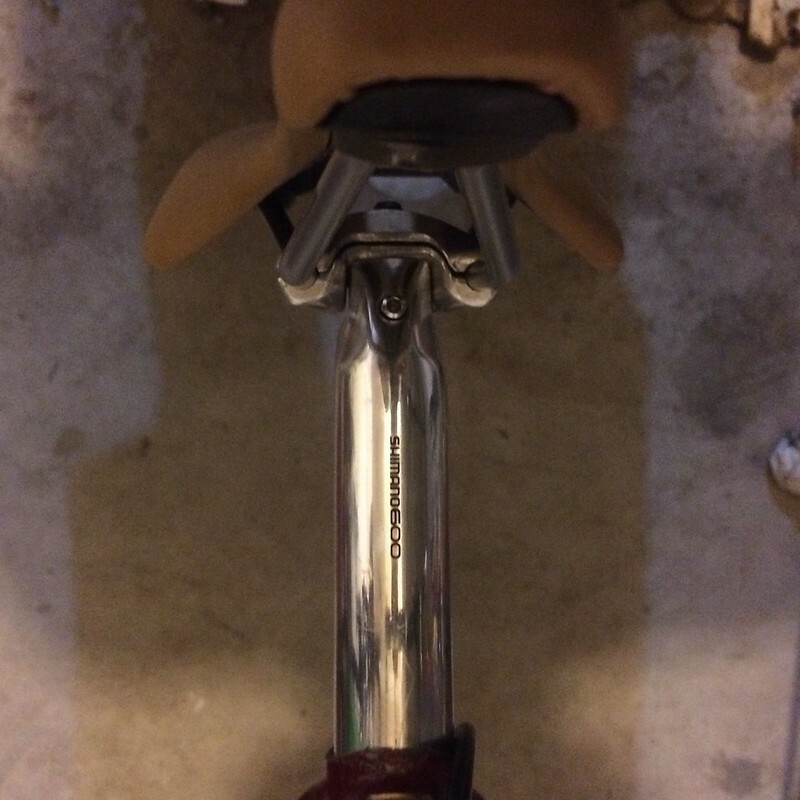 The last piece arrived today -- a shiny 27.0 Shimano 600 seatpost, which I believe brings me to five entirely different generations of Shimano parts on this bike spanning four decades, none of which is the decade in which the frame was made. Since the pictures above I've also changed the stem, built the new wheels, upgraded the tires and even found a gold water bottle cage to match the decals. I'll post more baby pictures the next time I get it out in the sun. I'm really loving this bike.